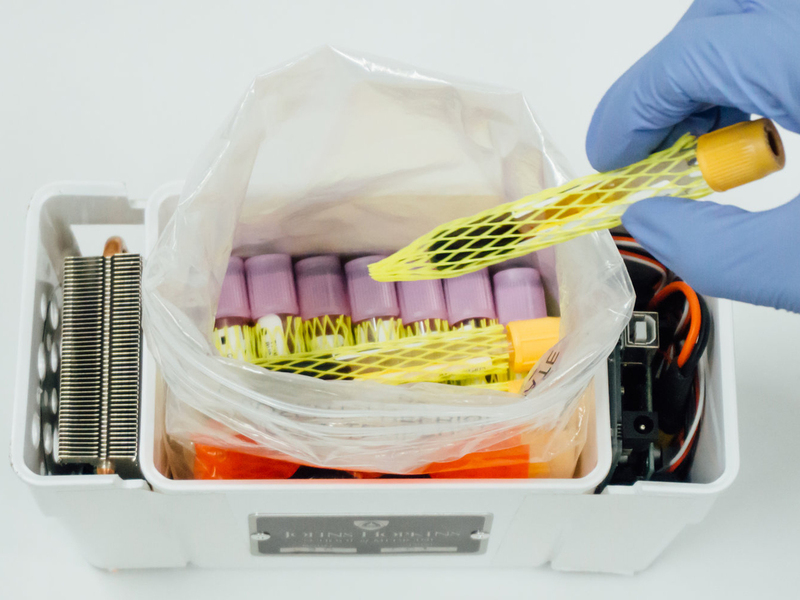 Drone Delivery For Medical Supplies, Lab Samples And Blood : Shots - Health News Proposals for drones to carry blood, trauma supplies and lab samples are awaiting approval by the Federal Aviation Administration. If the ideas get a green light, they could usher in a new drone age. 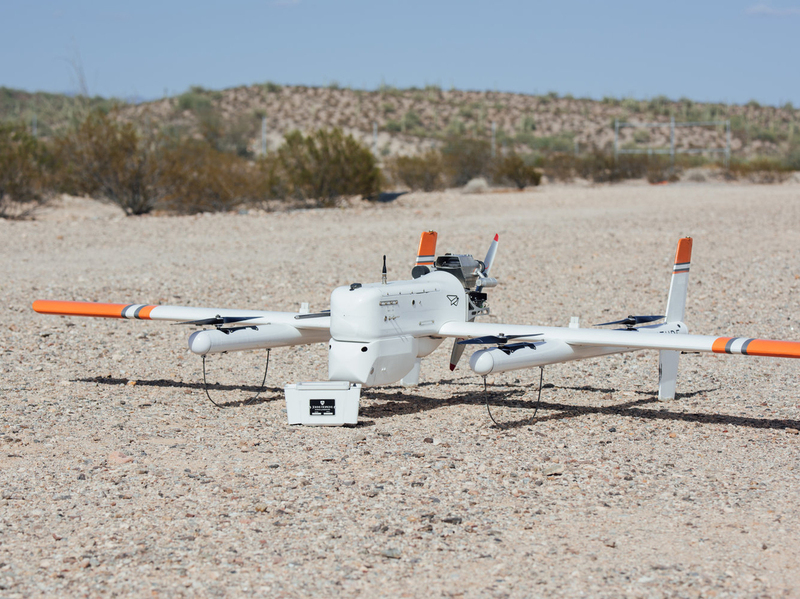 The HQ-40 drone, made by Tuscon, Ariz.-based Latitude Engineering, can carry samples for medical testing in a refrigerated container. One shred of solace that surfaced as hurricanes and tropical storms pummeled Texas, Florida and Puerto Rico last fall was the opportunity to see drones realize some of their life-saving potential. During those disasters unmanned aircraft surveyed wrecked roads, bridges and rail lines. They spotted oil and gas leaks. They inspected damaged cell towers that had left thousands unable to call for help. "Drones became a literal lifeline," former Federal Aviation Administration chief Michael Huerta told the agency's drone advisory committee in November. The drones used needed a special exemption from a set of FAA rules, known as Part 107, that normally require small drones to fly below 400 feet, stay within the operator's visual line of sight and avoid populated areas. These regulations make it hard for commercial drones to operate in the United States. But last October the Department of Transportation took a big step: It invited state and local governments to partner with universities and companies on tests to speed the integration of drones into the national airspace. The FAA is reviewing 149 proposals and plans to choose five to 10 by mid-May. The proposals cover a wide range of applications. Many of them are health-related. "I am confident that one-half or more of all the applicants have put some element of medical support in their proposal," says John Walker, a Lancaster, Penn.-based aerospace consultant who spent 32 years at the FAA before co-founding the Padina Group, Inc in 2006. Walker believes early public acceptance of drone delivery networks in urban areas will revolve around hospitals. And once drones can safely and reliably carry blood and medical supplies, that will pave the way to other kinds of drone deliveries. "That linear network where drones can operate between hospitals ... would also have Amazon and anyone else that could meet the requirements to operate," Walker says. Several companies have approached governments in developing countries about performing medical deliveries in areas with great need, poor roads and less crowded skies. In late 2016 Zipline, a San Francisco Bay Area-based robotics startup, set up distribution centers in Rwanda, where its drones had made more than 1400 flights carrying on-demand blood and emergency supplies over 62,000 miles as of last fall. This year the company will expand its medical delivery operations by launching a second base in Rwanda and new service in a larger neighboring country, Tanzania. Last October Swiss Post launched a medical transport network in Lugano, Switzerland, using drones made by another Bay Area company, Matternet. So far the drones have made 350 deliveries, about 5 to 15 per day. Other groups have also brought aircraft abroad to attempt health-related deliveries, but those demo flights have not become sustained operations. Such efforts face tougher hurdles here in the U.S. where regulations focus on safely integrating drones into already congested national airspace. "We haven't seen [the FAA] be interested in a one-off approach," says Susan Roberts, co-founder of AiRXOS, a General Electric subsidiary focused on drone infrastructure technologies. "It doesn't do anybody any good for a delivery company to be able to fly from two specific points if they can't then scale that over and over again." Beyond blood and medical supply deliveries, drones could transform another key component of healthcare — lab tests. Timely test results help doctors diagnose infections and reduce guesswork in prescribing medications. Some of those decisions have life-or-death implications. For example, newborn babies turn yellow from jaundice as their bodies make bilirubin, a byproduct formed during normal breakdown of red blood cells. But "very high bilirubin can be toxic to babies," says Dr. Geoff Baird, a clinical pathologist at the University of Washington in Seattle. Of the millions of blood samples, urine specimens and swabs his team processes each year, most reach central lab facilities by car. "We have cars going seven days a week, many times a day, up and down the state of Washington on freeways, across the passes, in the mountains," Baird says. The university also does testing for out-of-state hospitals and several clinics in rural communities on the San Juan Islands off the northwest coast of Washington. Getting lab samples from the islands down to Seattle hospitals for testing requires multiple stops by car, plane and ferry — a journey of about 100 miles that often takes more than 24 hours, even longer on weekends. But samples carried over the Puget Sound on a drone from the San Juan Islands could reach the main lab in Seattle in 90 minutes, Baird says. That's why the university was eager to put in a bid for the FAA program. A temperature-controlled container was designed by Johns Hopkins researchers to transport specimens, like these test tubes containing blood samples. The proposed medical deliveries are part of a larger application submitted by Washington's Department of Transportation, which includes other companies such as Amazon and T-Mobile. If selected, Baird says the San Juan efforts will use drones developed at Tuscon, Ariz.-based Latitude Engineering. Latitude makes the military-grade aircraft that Johns Hopkins researchers used to set a distance record carrying refrigerated blood samples ~160 miles in a 3-hour flight across the desert. North Carolina's Department of Transportation also applied to the FAA program wanting to use drones for medical deliveries. Zipline and Matternet are on that application as well as several other undisclosed proposals. Matternet is also partnering with the city of Palo Alto on a proposal to shuttle blood to Stanford hospitals. Flirtey, a drone manufacturer in Reno, Nev., is focusing on using its aircraft for last-mile delivery of defibrillators — devices the company thinks could save hundreds of thousands of lives in America each year, by increasing the chance of survival from out-of-hospital cardiac arrest. Ultimately, though, what makes or breaks a proposal isn't likely the whiz-bang drones but rather the underlying infrastructure that ensures they can fly safely alongside commercial jets, helicopters, balloons and everything else in the sky. Toward that end, at a drone symposium held earlier this week in Baltimore, the FAA stressed its interest in "sense and avoid" technologies to prevent drone crashes, and systems that allow drones to be identified and tracked remotely. GE's projects cover both areas. "No one company is going to solve everything. We're taking a holistic approach," Roberts says. "We need to help the medical deliveries, we need to help the inspectors, we need to help people who are just taking pictures of houses." The United Nations Children's Fund is working to foster this all-inclusive spirit at the global level. Last summer, UNICEF worked with local governments in the African country of Malawi to launch a drone corridor for companies, universities and nonprofits to fly test missions there. More recently, UNICEF invited groups to transport vaccines in Vanuatu, the South Pacific nation made up of roughly 80 islands east of Australia. The drone corridors run on a barter system, says Chris Fabian, who leads UNICEF's venture capital arm. "If you come and use our time, create something that's open-source and useful for everyone else."